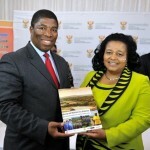 Minister Molewa, at the launch of the Mining and Biodiversity Guidelines at Kirstenbosch, Cape Town on 22 May 2013. The Mining and Biodiversity Guideline: mainstreaming biodiversity into the mining sector is formally endorsed by the Ministers of both Environmental Affairs and Mineral Resources, as well as the CEO of the Chamber of Mines. It interprets the best available biodiversity knowledge and science in terms of the implications and risks for mining in a practical guideline and user-friendly decision support tool for both industry and regulators to ensure that biodiversity issues are consistently incorporated into the decision making processes for mining projects. The Guideline is a product of the unique collaboration between the mining and biodiversity sectors. The development of this guideline was initiated by the Chamber of Mines and the South African Mining and Biodiversity Forum (SAMBF), in partnership with the Department of Environmental Affairs and the Department of Mineral Resources, and with technical input and coordination by the South African National Biodiversity Institute’s (SANBI) Grasslands Programme, and with cooperation from numerous other stakeholders including government, NGOs, the scientific fraternity and the private sector. The Chamber of Mines has committed its full membership – 69 major mining companies – to implementing the Guideline. “We have to work together across sectors, as it is only by working together that we can do more” says Minister Molewa. Mining and Biodiversity Guideline – this is the full guideline that outlines the six principles for good decision making and goes into detail on the implications for mining companies and regulators at every stage of the mining cycle (100 pages). Executive summary of the Mining and Biodiversity Guideline – this provides a 12-page overview of the Mining and Biodiversity Guideline for decision makers. Poster of the Mining and Biodiversity Guideline – this is a wall poster designed to communicate the main messages of the Mining and Biodiversity Guideline and serve as a summary of the different categories of biodiversity priority areas and the implications for mining. Spatial data that underlie the map of biodiversity priority areas.